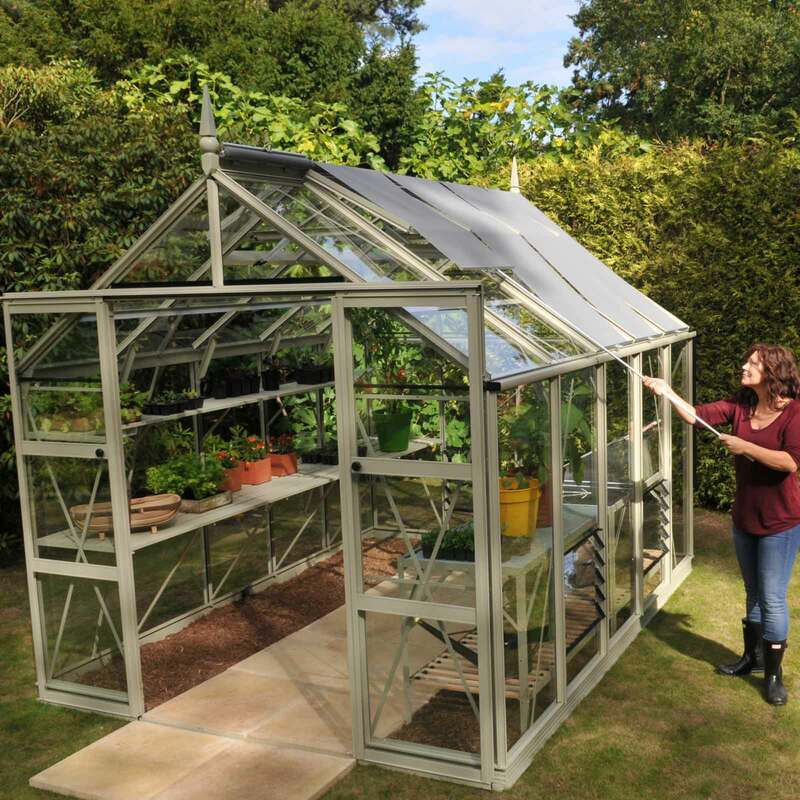 The HARROD SUPERIOR GREENHOUSE in WILLOW GREY is an elegant design, strong and full of features such as integral roof blinds along one side of the roof and vast amounts of ventilation to provide the best growing environment of any greenhouse available today. The contemporary Willow Grey colour of the Greenhouse will complement any garden setting and can be fully customised internally with a range of optional integral and freestanding staging, as well as shelves too, for more info on any of the optional extras just click on the thumbnail images below. PLEASE ALLOW 6-8 WEEKS FOR DELIVERY. This product is exempt from any promotions, discounts and express delivery. The HARROD SUPERIOR GREENHOUSE in Willow Grey is an elegant and strong greenhouse which comes with a 25 year Framework Guarantee. This high quality greenhouse uses 4mm toughened glass and is packed full of features. These include integral roof blinds along one side of the roof and unrivalled vast amounts of ventilation to provide the best possible growing environment. 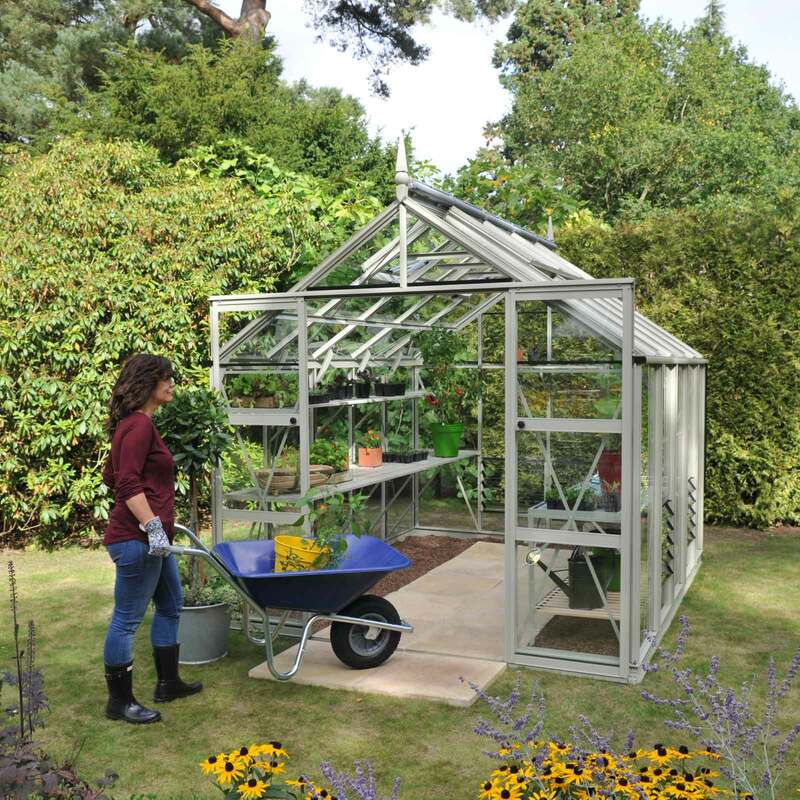 You can customise your greenhouse internally with a range of optional integral and freestanding staging and shelves too, supplied in the same willow grey colour to match your greenhouse. 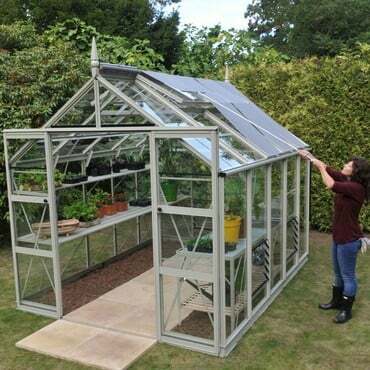 Browse our online catalogue for lots more information about our stunning range of greenhouses. • Superior 25 YEAR GUARANTEED ALUMINIUM FRAMEWORK that is topped with a distinctive finial. 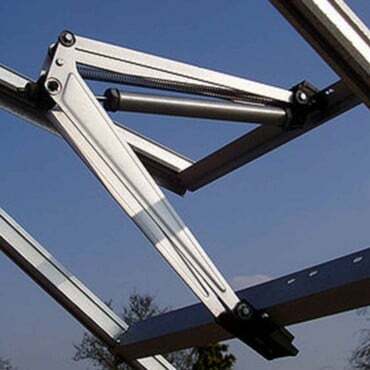 Major aluminium frame sections are far stronger than many models from well respected manufacturers - e.g. the eaves and glazing bars are almost two and a half times heavier! • Frames expertly powder coated in a contemporary Willow Grey - Olive Green & Antique Ivory also available. 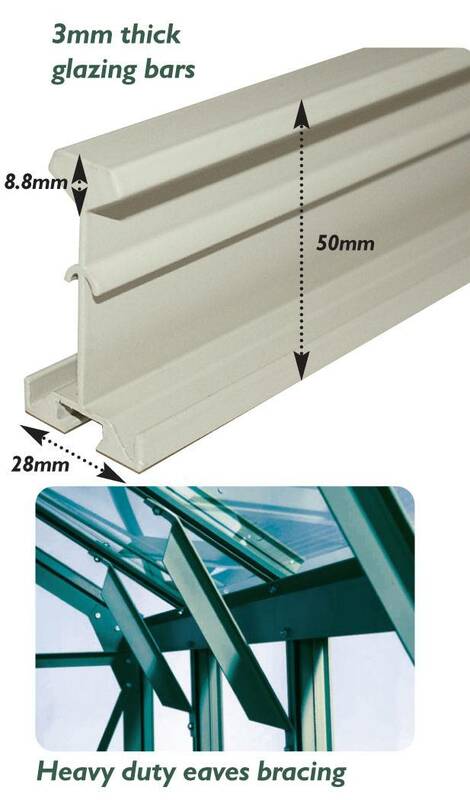 • Heavy duty aluminimum braces on every roof bay, 2 at the eaves and 1 at the ridge adds enormous strength. • Glazed with 4mm toughened glass for both strength and your safety. Far superior to 3mm glass often found in most greenhouses. All glass confirms to the required British Standard and carries the BS Kitemark EN12150-1:20. 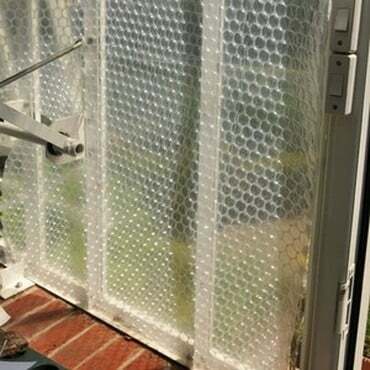 • ‘Lock in’ glazing system using beads rather than clips - adds significantly to the strength of the greenhouse whilst having a far better appearance and is easier and safer to assemble too. • Stands on ALL SURFACES with a 4"/10cm H aluminium base plinth. 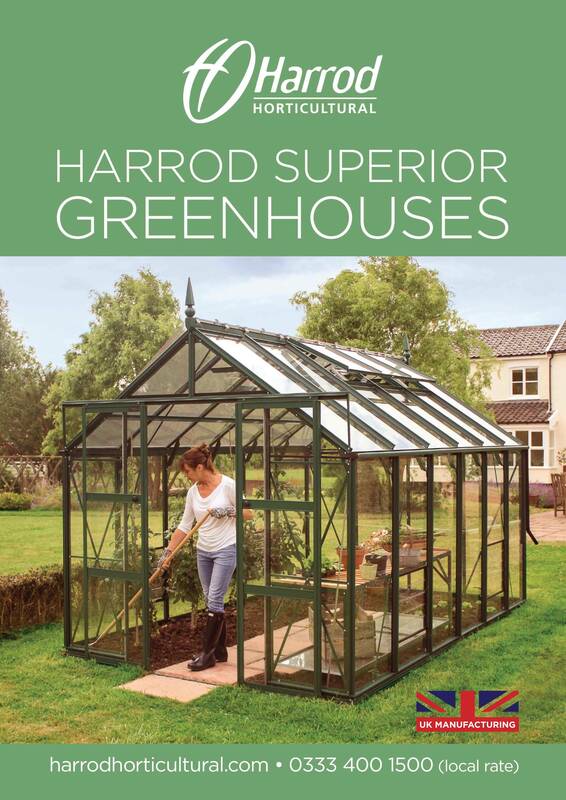 As well as being able to site on an existing hardstanding area with stainless steel ground anchors that secure with supplied expansion bolts, the Harrod Superior Greenhouse can also be put directly on the soil. 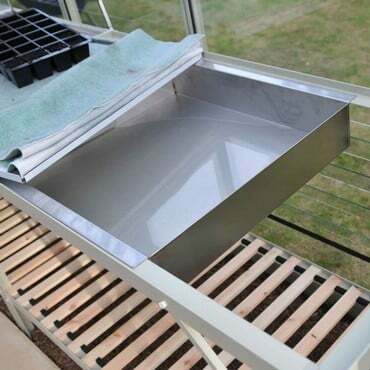 Siting directly on soil using supplied heavy duty stainless steel ground anchors offers an opportunity to SAVE £HUNDREDS on building a special base for the greenhouse. 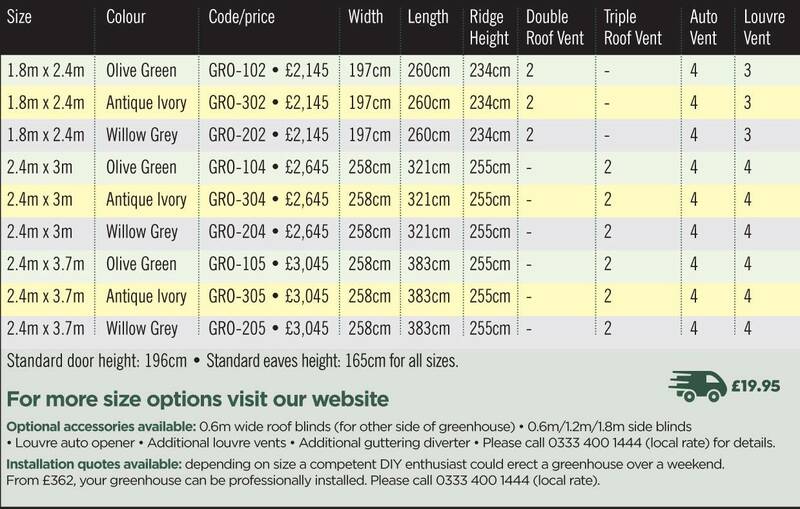 • Unrivalled ventilation with at least 2 x double or 2 x triple roof vents; at least 2 x bayliss autovents; at least 3 x louvre vents - the number varying depending on greenhouse size, see the GREENHOUSE PRICING OPTIONS tab above for specific clarification. 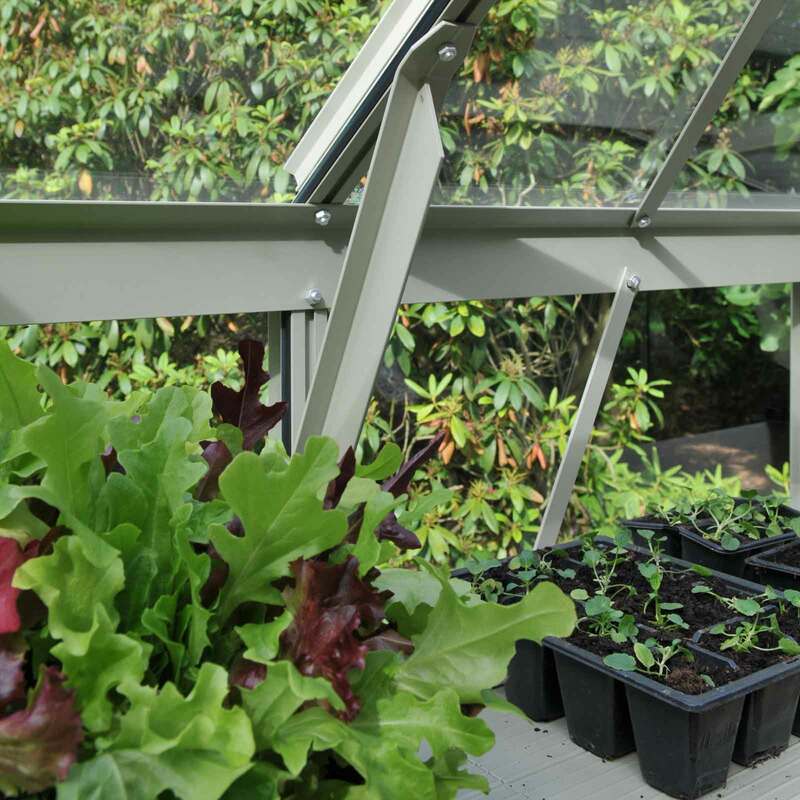 The generous amounts of ventilation ensures that our Superior design has more ventilation included than any other model on the market to prevent the greenhouse from overheating and ensuring fresh air can circulate and cool. • Attractive blinds. Each Harrod Superior greenhouse is supplied with a set of external roller blinds that are hugely beneficial in reducing the heat and scorching from as early as February onwards. Covering one side of the roof, the blinds are very neat in appearance in sophisticated grey to match the frame colour and are simple to operate with a supplied reach pole - no cords or pulleys. • Gutters & downpipes - the large integral gutters come with rigid downpipes and sufficient fittings to direct rainwater into water butts. • Hanging basket rails - a great feature with 2 strong rails on each side that are a perfect place to hang floral baskets. • Low threshold doorway - no step to trip over! 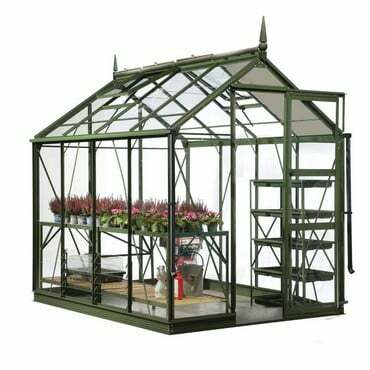 There is a generous 2ft wide single door on 6ft wide greenhouses; 4ft wide double doors on 8ft+ wide greenhouses to allow perfect access for a wheelbarrow or wheelchair. 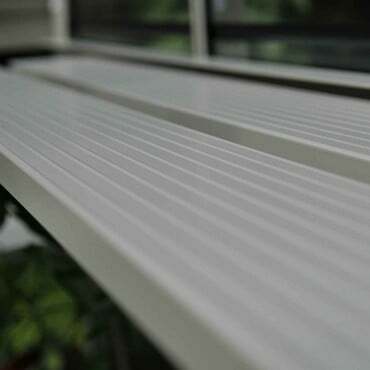 An optional stainless steel ramp is available. • Variety of width and length sizes - see order table above. Ridge heights are 234cm/7ft 8" for 6ft wide sizes; 255cm/8ft 5" for 8ft wide sizs. All door heights are 196cm/6ft 5" - please note doors are positioned in the width side of the greenhouse, usually the shorter length. All eaves heights are 165/5ft 5". For all sizes at a glance, click the GREENHOUSE PRICING OPTIONS tab above. 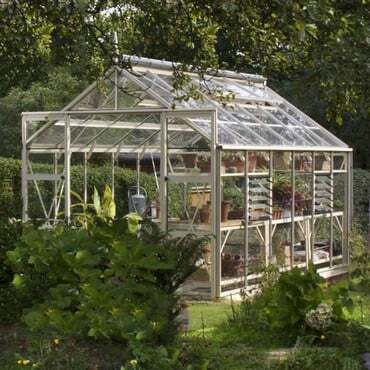 • Greenhouses also available in Olive Green and Antique Ivory. DELIVERY - please allow 6-8 weeks for delivery. Please note that Greenhouses are delivered on lorries and if access is restricted then there will be an extra surcharge for delivery on a smaller vehicle. There is an additional surcharge for deliveries to Scotland, Wales, Cornwall and Devon - please call 0333 400 1444 for a quote. 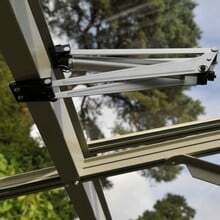 FRAMEWORK SAMPLES - available upon request, please contact us for details - 0333 400 1444 (local rate). 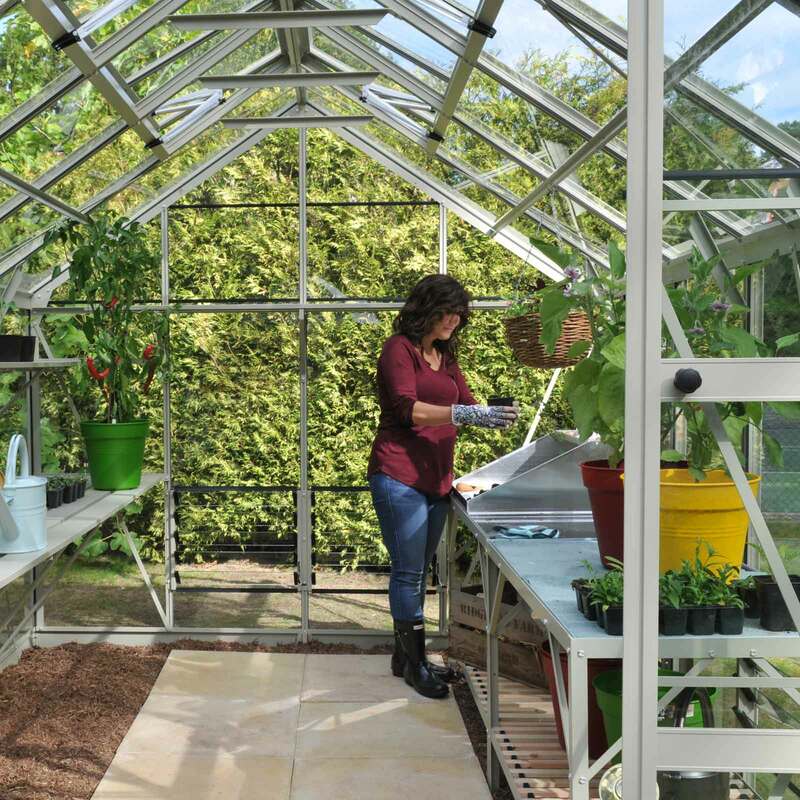 CUSTOMISE YOUR GREENHOUSE INTERNALLY - to add optional integral and freestanding staging as well as shelves, see the items displayed beneath the greenhouse order table. 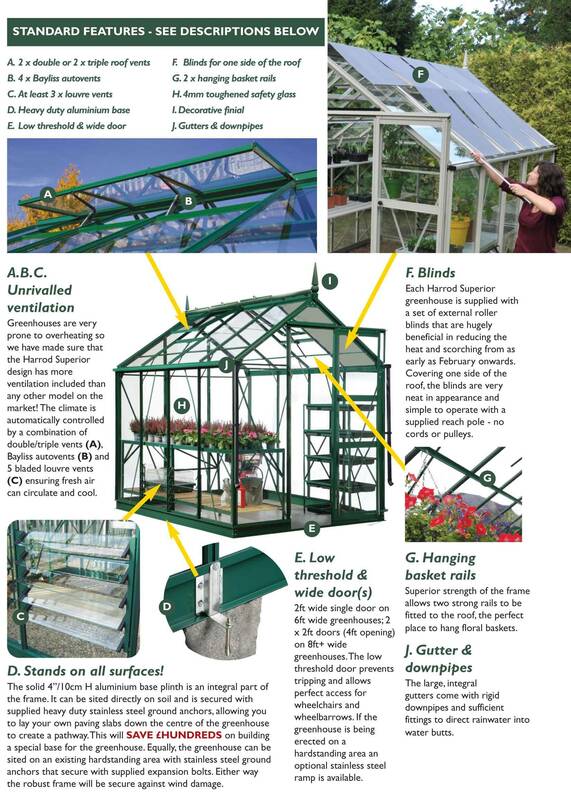 GREENHOUSE OPTIONAL ACCESSORIES - include 2ft wide roof blinds (for other side of greenhouse); side blinds; additional reach pole for blinds; stainless steel access ramps; additional louvre vents; additional guttering diverter. Please call 0333 400 1444 (local rate) for details. PROFESSIONAL INSTALLATION QUOTES AVAILABLE from £362 - please call 0333 400 1444 (local rate). A competent DIY enthusiast could erect a greenhouse over a weekend. 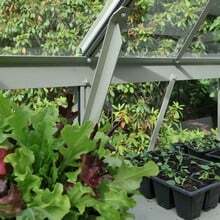 More images are available of the Greenhouse - please contact us for more details. Careful and correct site and base preparation is absolutely essential for correct installation of your Harrod Superior greenhouse. Please carefully read these guidelines and contact us if anything is unclear or should you have any further questions. - should be safe to work on with no trip or other hazards. 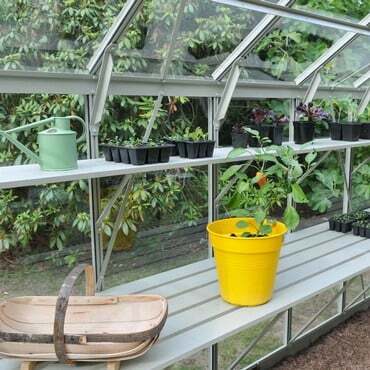 - must include sufficient space to lay out and assemble the greenhouse components. 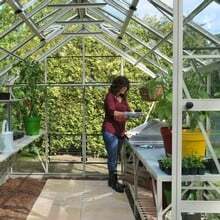 - should have enough working room around the outside the greenhouse to safely work and use a stepladder, including carrying and manoeuvring large panes of glass. - should have convenient access to electricity and water, if so required. 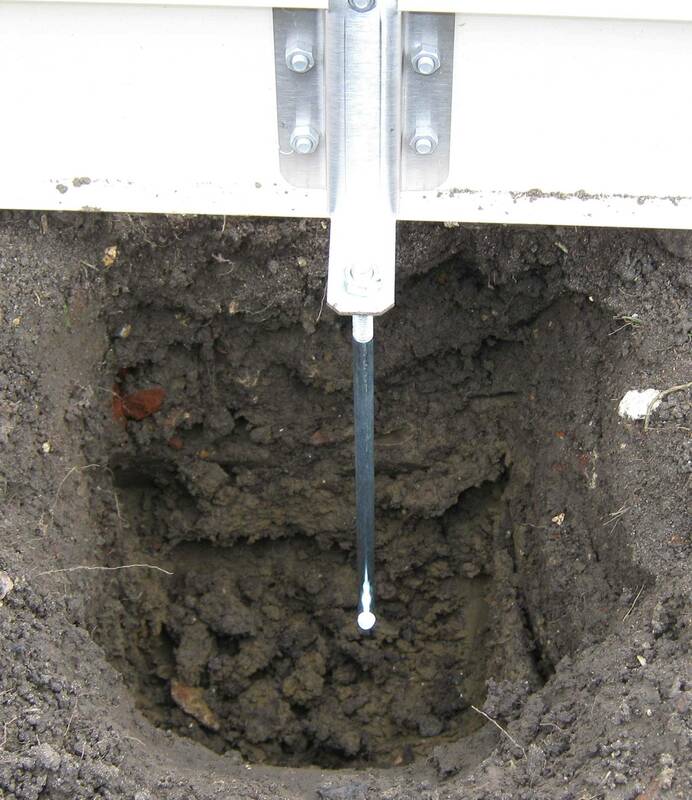 Whilst you do need to take time and care to properly prepare a soil site to the required standard, it does have the considerable advantage of doing away with the extra cost and time of building hardstand foundations - if that is something you wish to avoid. This is only possible because the Harrod Superior greenhouse is so strong. 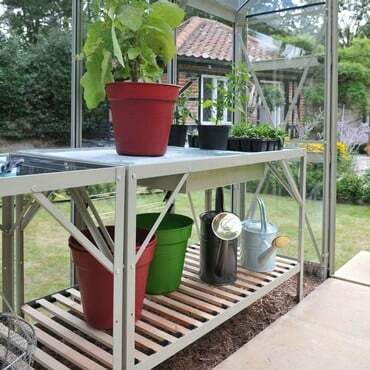 Its combination of a sturdy base and framework mean it will happily sit on a properly prepared soil site. 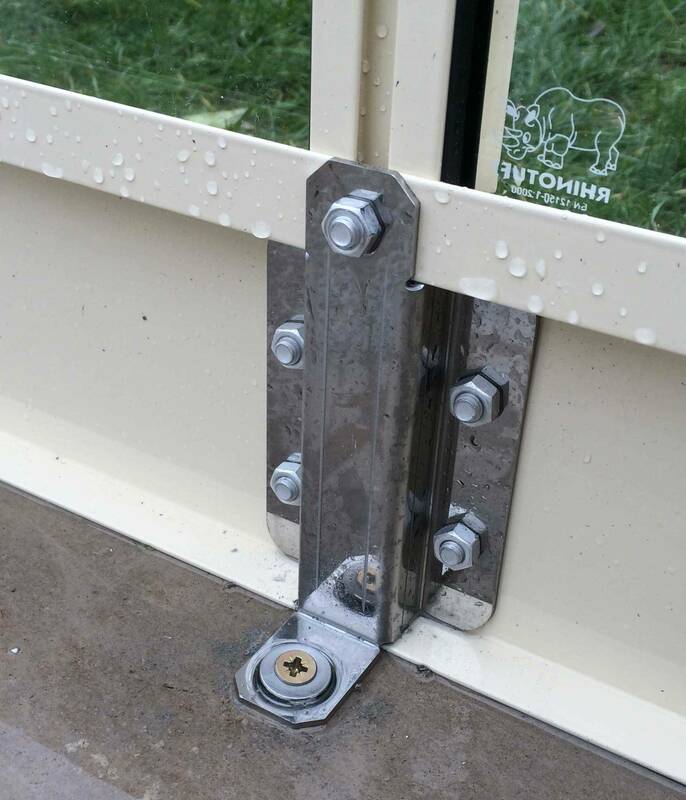 It is held in its permanent position by concreting in place using the specially supplied brackets and J shaped ground anchors. - Paving Slabs: must be laid flat and level and should ideally be slightly over the greenhouse footprint size (please contact us to confirm exact size as this may differ from nominal sizes quoted verbally, in sales literature or website descriptions). - Concreted Area: see ‘Paving Slabs’ above. On all types of hardstand base the greenhouse is held in its permanent position by plugging and screwing down using the specially supplied base brackets and, wherever possible, the supplied rawlbolts. 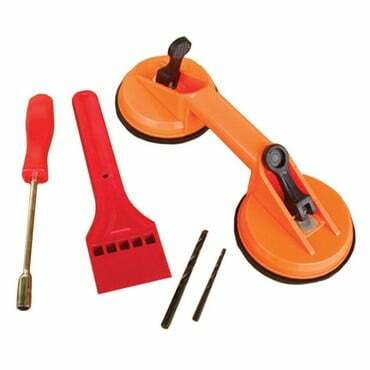 However, please note that some hardstand bases may require a different fixing, which is the customer’s responsibility to source and use. We also strongly recommend that the top course is laid ‘frogs down’ to give a smooth surface on which to sit and fix down the greenhouse and that bricks/blocks are of a type that will allow drilling without cracking or splintering. 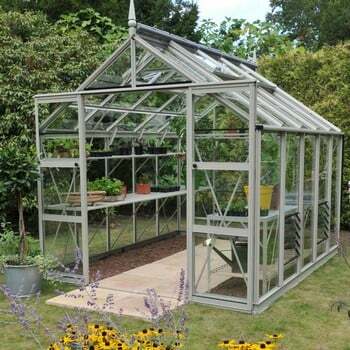 The Harrod Superior Greenhouse in Willow Grey is an elegant design, and is packed with features such as integral blinds along one side of the roof, and vast amounts of ventilation to provide the best growing environment of any structure available today. Harrod Horticultural started life as a small offshoot from a much bigger family-owned parent business making sports equipment. 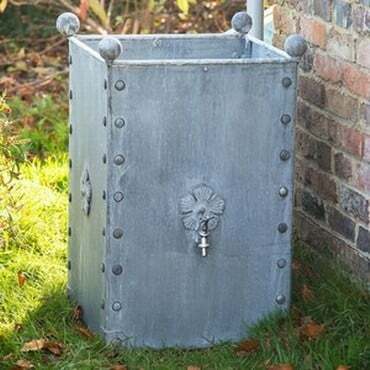 In little over a decade the company has grown to become a major player in the garden product manufacturing world, with a reputation for quality products. 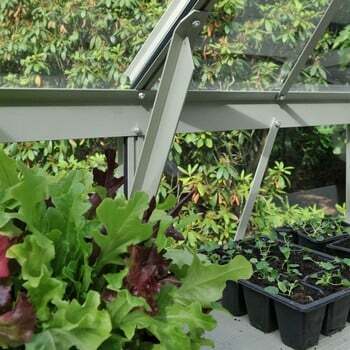 Its superior greenhouse range offers fully glazed, powder-coated aluminium structures with a number of innovative features such as a lock-in glazing system to improve safety and aesthetics, instead of the more usual glazing clips. The powder coating can be specified in a variety of colours and the frame is guaranteed for 25 years.